MOHANDAS KARAMCHAND GANDHI Autograph Letter Signed. Indian political and spiritual leader, known as 'Mahatma'. ALS. 2pp. As at Nadiad. 30th April, no year . To Sir William Vincent. 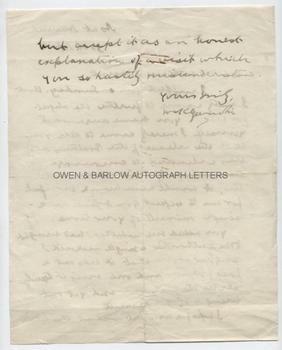 Together with a Letter (TLS) from Sir William Vincent to Lady Henry Rawlinson referring to Gandhi's letter. "Dear Sir William Vincent, I ruffled you on Sunday. But I really came to further the object for which you have overworked yourself. I merely came to tell you that the release of the Brothers Ali was intended to encourage recruiting. If I did not believe this it would have been sinful for me to expect you to give me a single minute of your time. You asked me whether I had brought to the authorities a single recruit. I suggest to you that it was not a fair question and one might truly serve the Empire and yet not bring a single recruit. I hope you will not resent this letter but will accept it as an honest explanation of a visit you so hastily misunderstood. Yours sincerely, M.K. Gandhi." The accompanying TLS from Sir Vincent to Lady Rawlinson is 1p, Simla 22nd June 1921. 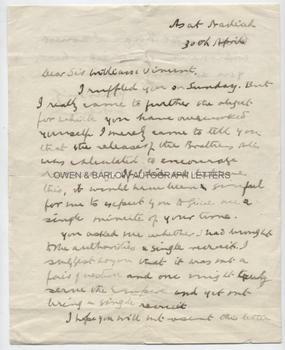 "Dear Lady Rawlinson, I have discovered Gandhi's letter and send it to you. It was written in April 1918 at the time of the War Conference. Gandhi was very anxious that Government should release Mohamed Ali and Shukat Ali which I refused to do for obvious reasons - a refusal which I think their subsequent conduct has fully justified. I do not think it would be fair to Mr. Gandhi to allow his letter to be put up for sale but I understand you do not want it for that purpose. I am afraid I have no letters that would have any value at the sale but I shall be glad to help in any other way I can." A letter of historical importance. Gandhi first employed non-violent civil disobedience as an expatriate lawyer in South Africa, in the resident Indian community's struggle for civil rights. After his return to India in 1915, he set about organising peasants and farmers in protesting excessive land-tax and discrimination. In April 1918, during the latter part of World War 1, the Viceroy invited Gandhi to a War Conference in Delhi. Perhaps to show his support for the Empire and so help his case for India's independence, Gandhi agreed to actively recruit Indians for the war effort. In contrast to the Zulu war of 1906 and the outbreak of World War 1 in 1914, when he recruited volunteers for the Ambulance Corps, this time Gandhi attempted to recruit combatants. In a June 1918 leaflet entitled "Appeal for Enlistment", Gandhi wrote "To bring about such a state of things we should have the ability to defend ourselves, that is the ability to bear arms and to use them. . . If we want to learn the use of arms with the greatest possible dispatch, it is our duty to enlist ourselves in the army." He did, however, stipulate in a letter to the Viceroy's private secretary that he "personally will not kill or injure anybody, friend or foe". Gandhi's war recruitment campaign brought into question his consistency on non-violence, as his friend Charlie Andrews confirmed: "Personally, I have never been able to reconcile this with his own conduct in other respects, and it is one of the points where I have found myself in painful disagreement." Gandhi's private secretary also acknowledged that "the question of the consistency between his creed 'Ahimsa' (non-violence) and his recruiting campaign was raised not only then but has been discussed ever since". This letter demonstrates that Gandhi was oposed to the idea of recruitment and it is perhaps typical that he should have initially agreed in principal but passively resisted in actively working to encourage recruitment to the British Forces. The text of Gandhi's letter was published in The Collected Works of Mahatma Gandhi from the Ms of Mahadev Desai's Diary. Autograph letters of Gandhi are rare.